To start with the packaging ! The packaging alone makes you want to purchase it, it's so cute. The colors are so amazing and natural. When applying it leaves your face so soft and smooth. Too faced is an amazing brand ! Love love love it ! i love this product, and it leaves my skin soft and smooth. 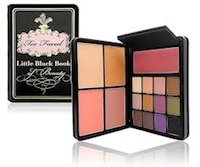 I just recently bought Too Faced newest palette for eyes, cheeks, and lips called Little Black Book of Beauty and I was blown away by the package. The eyeshadow colors are highly pigmented and the blushes, bronzer and highlighter work well on my skintone (I have a warm tone). The lip gloss is a pink which would work well on anyone and a bonus mascara wraps up the package. What I love about this product is you have everything in a compact package you can take anywhere and the colors work really well together. The only downside is there is no eyeliner, but the black eyeshadow can easily double as one with a brush as one. Best combination package so far! My first try of Too Faced products did not disappoint...I definitely recommend this to anyone who wants beauty and value in one package.